Copyright © 2007-2014 Offender Solutions® Inc either owns the intellectual property rights in the underlying HTML, text, audio clips, video clips and other content that is made available to you on this and associated Offender Solutions Inc. pages or has obtained the permission from the owner of the intellectual property to use the content on this and associated Offender Solutions® pages. Offender Solutions® is the proprietor of the Federal trademark serial no. 85027407 for OFFENDER SOLUTIONS®. The Offender Solutions® Inc. logo is the ® Registered Trade Mark of Offender Solutions® Inc. All product names mentioned on this Home Page and associated Offender Solutions® Inc. pages are the trademarks of their respective owners. Offender Solutions® is the proprietor of the Federal trademark serial no. 85027407 for OFFENDER SOLUTIONS®. 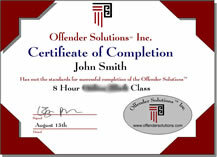 For a variety of reasons, legal, ethical, practical and more, all of the information and materials posted/published on by Offender Solutions® Inc. (Offender Solutions®) and on the Offender Solutions® web site ( www.offendersolutions.com ) are intended to be informational only. As noted in other portions of this web site, Offender Solutions® is not aware of your specific circumstances and it would be irresponsible of us to attempt to give you specific or prescriptive advice. Nothing on the Offender Solutions® web site can or should be construed or interpreted to be a viable substitute for competent professional medical, psychiatric, psychological, counseling or nursing guidance, advice or services. The Offender Solutions® web site is not intended to be a substitute for professional medical care or attention by a qualified practitioner nor should it be construed as such. The sole purpose of the Offender Solutions® web site is to be an informational resource for providers, consumers, family members and those interested in behavioral healthcare topics. Persons in need of a professional opinion are advised to seek the advise of a qualified psychologist, physician, attorney or other professional. Do not use any information on any Offender Solutions® web page or otherwise to diagnose or treat any issues of any sort in your life. Offender Solutions®. will not be liable for any direct, indirect, consequential, special, exemplary or other damages arising therefrom. The information on the Offender Solutions® Inc. web site is provided on the basis that persons accessing the web site undertake responsibility for making their own assessment of the information and are advised to verify all relevant representations, statements and information. Offender Solutions® Inc. ("Offender Solutions®") provides access to resources and other information on this web site as a public service. While Offender Solutions® makes reasonable efforts to post current, complete and accurate information, it does not guarantee or warrant that the information is current, complete or accurate. All information is subject to change at any time without notice. Any use of this site is deemed to constitute acceptance of all terms and conditions set forth herein. The information on this web site may contain technical inaccuracies or typographical errors which will be corrected when identified. Offender Solutions®. shall in no event accept any liability for loss or damage suffered by any person or body due to information provided on this web site or linked web sites. Offender Solutions® Inc. also does not implicitly or explicitly endorse any web site, organization or people who have off-site links to Offender Solutions's® web site Offender Solutions® assumes no liability for the actions or services of "Certified" Offender Solutions® Counselors or any other person not expressly employed by, and under the supervision of, Offender Solutions®, an Oregon, USA corporation. Offender Solutions® assumes no responsibility for any errors or omissions in the information provided on this web site and makes no representations or warranties about the suitability of the information contained here for any purpose. All information or documents are provided "as is", without warranty of any kind. Offender Solutions® assumes no responsibility for any errors, omissions or other discrepancies between the electronic and printed versions of documents. Offender Solutions® disclaims all warranties and conditions, express or implied, with regard to the information, including all implied warranties and conditions of merchantability, fitness for a particular purpose, title and non-infringement. Offender Solutions® shall not be liable for any special, indirect or consequential damages or any damages whatsoever arising out of, resulting from or in connection with the use, application or performance of information available from this site. The information provided on this Home Page and all associated Offender Solutions® Inc. pages is not intended to be legal advice. Many factors unknown to us may affect the applicability of any statement or comment that we make on this Home Page, and associated Offender Solutions® Inc. pages, to your particular circumstances and, as such, guaranteed outcomes are not expressed or implied in any way. Offender Solutions® provides links to other web sites maintained by other entities as a convenience to the public. Reasonable precautions are taken to link only to web sites which are appropriate and maintained by reputable organizations. However, the inclusion of these links does not constitute or imply Offender Solutions®'s endorsement of, affiliation with or responsibility for those web sites. Those web sites are not under Offender Solutions® control and Offender Solutions® is not responsible for the information or opinions expressed in those sites. Users link to such sites at their own risk. Any concerns regarding external links should be directed to the site administrator of the external site. Hyperlinks to or from this Web site do not imply endorsement of the material on those sites or association with the operators. Copyright © 2007-2014 Offender Solutions®, All Rights Reserved and this limited license. No other use is permitted. Without limiting the generality of the forgoing, you may not: a) make any commercial use of such content; b) include such content in or with any product that you create or distribute; or c) copy such content onto your or any other person's World Wide Web Home Page. Nothing contained in this Section shall be construed as conferring any right in any copyright of Offender Solutions® Inc. or any other person(s) who own(s) the copyright in content provided on this Home Page or associated Offender Solutions® Inc. pages. Any issues concerning this disclaimer and/or use of the Offender Solutions® web site shall be governed by and construed in accordance with Oregon State law. Offender Solutions® does not endorse and is not legally responsible for the quality or accuracy of information in sites linked to the Offender Solutions® web site This disclaimer is applicable domestically (throughout the United States of America) and worldwide. Users and subscribers of this system are required to respect the legal protection provided by copyright and license to programs and data. If you believe that your work has been copied, adapted, reproduced, or exhibited on this website (http://www.offendersolutions.com) in a way that constitutes copyright infringement, please provide written notice of the claimed infringing activity to the Offender Solutions® designated agent, in accordance with the requirements of the Digital Millenium Copyright Act, 17 U.S.C. § 512. 3. Identification of the material that is claimed to be infringing or to be the subject of infringing activity and that is to be removed or access to which is to be disabled, and information reasonably sufficient to permit the Offender solutions® Inc. to locate the material. 4. Information reasonably sufficient to permit the Offender solutions® Inc. to contact the complaining party, such as an address, telephone number, and, if available, an electronic mail address at which the complaining party may be contacted. Upon receipt of notification of claimed copyright infringement, the Offender Solutions® will follow the procedures outlined in Title II of the Digital Millenium Copyright Act (17 U.S.C. § 512). It is expected that all users of this system will comply with applicable copyright laws. However, if Offender Solutions® is notified of claimed copyright infringement, or otherwise becomes aware of facts and circumstances from which infringement is apparent, it will respond expeditiously by removing, or disabling access to, the material that is claimed to be infringing or to be the subject of infringing activity. Under appropriate circumstances, Offender Solutions® may, in its discretion, terminate the accounts of subscribers and account holders of its system or network who are repeat infringers. It is the Offender Solutions® policy to accommodate and not interfere with standard technical measures, i.e., technical measures that are used by copyright owners to identify or protect copyrighted works and (1) have been developed pursuant to a broad consensus of copyright owners and service providers in an open, fair, voluntary, multi-industry standards process; (2) are available to any person on reasonable and nondiscriminatory terms; and (3) do not impose substantial costs on service providers or substantial burdens on their systems or networks. Take an online class from Offender Solutions®. Get started on a better life - now!